Nan Kohler, owner of Grist & Toll, At-Large member. Jason Dinubilo, Phil O’Connell Grain Co., Alternate for Handler position. Kevin Ruble, wheat grower, Alternate for District 6 – Fresno. The California Wheat Commission Board consist of nine wheat producers, two handlers, two at-large members, and one public member — each with alternates. Involvement in the California Wheat Commission enables board members to set policies and programs that promote the state’s wheat industry. Learn more about our Board members/alternates! The California Wheat Commission (CWC) has joined California Grown as an AG Industry Organization. 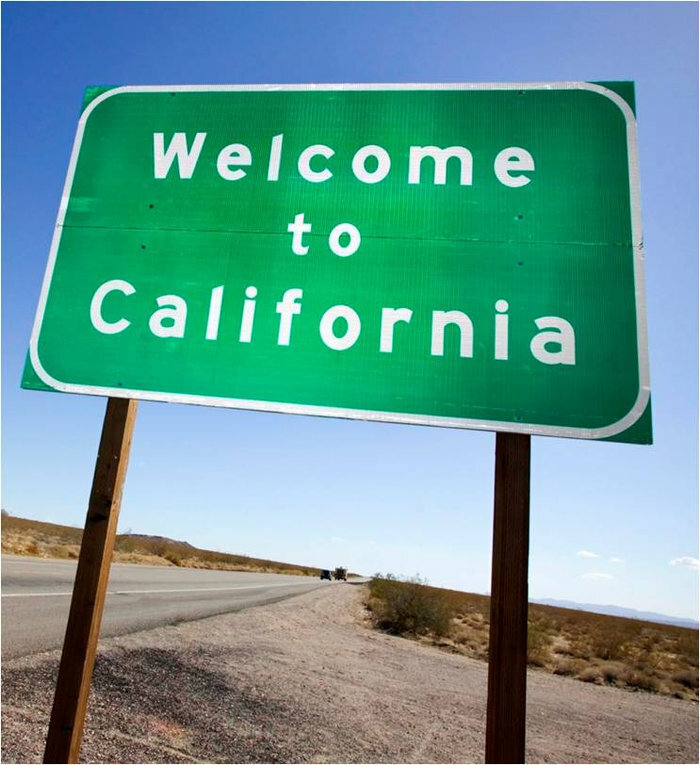 The California Department of Food and Agriculture and the Buy California Marketing Agreement developed the “California Grown” Advertising and Promotional Campaign to increase awareness and consumption of California agricultural products (generic and branded) among California consumers. The CWC Board decided to partner with them as it aligns well with our mission and new strategy plan: to help develop, promote and market California Wheat! We invite industry members to learn more about our partnership with CA Grown and how our partnership can help you! Stay tuned to learn more about the upcoming activities as our collaboration with CA Grown and their team begins. Foundation seed is now available for seed companies interested in the new UC-Central Red and UC-Desert Gold varieties. 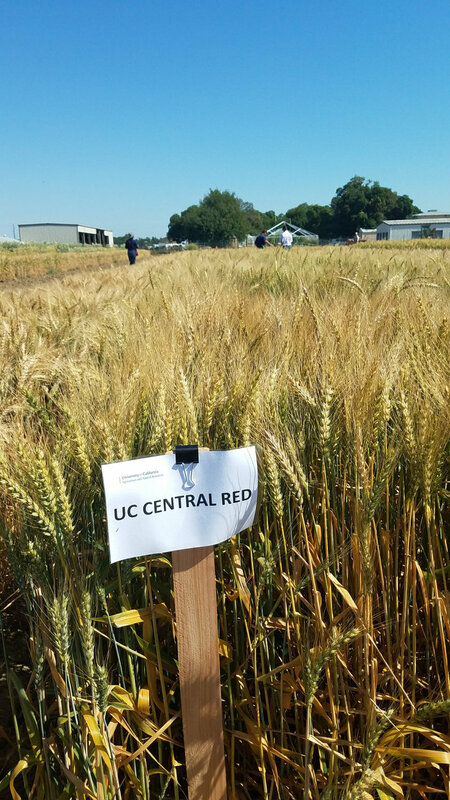 These varieties represent a higher level in the efforts of the UC Davis breeding program to improve the quality of the California wheat varieties while maintaining or improving their yield potential. UC-Central Red represents a significant improvement over the previous UCD HRS varieties Lassik and Yurok. In addition to the excellent quality evaluations for breadmaking quality from the California Wheat Commission quality laboratory and the different mills at the 2018 Collaborators Meetings this variety received the top scores in tortilla quality. This variety is well adapted to the Sacramento, San Joaquin and Imperial Valleys and is the top recommended UCD HRS wheat variety. UC-Desert Gold is a Desert Durum® variety with high-yield potential and excellent pasta quality. It is well adapted for the San Joaquin and Imperial valleys. UC-Desert Gold is very similar to Desert King but has two genes for improved yellow pigment in the pasta and one gene for reduced grain cadmium content (a beneficial human health trait). UC-Desert Gold is the UC Davis durum wheat recommended variety. Increased protein content; and Iron, and Zinc by 5 to 10% . Reducing gliadin epitopes – for gluten sensitivity. Our support to wheat research at UC Davis has a long term commitment to various efforts; which includes wheat varieties with increased nutritional value, disease resistance, improved quality, increased in yield, and more. For more information about UC Davis Wheat Breeding program, please click here. With another season getting underway, I’d like to take this opportunity to remind readers about where they can find information that the University of California produces about various aspects of wheat and other small grain production in California. 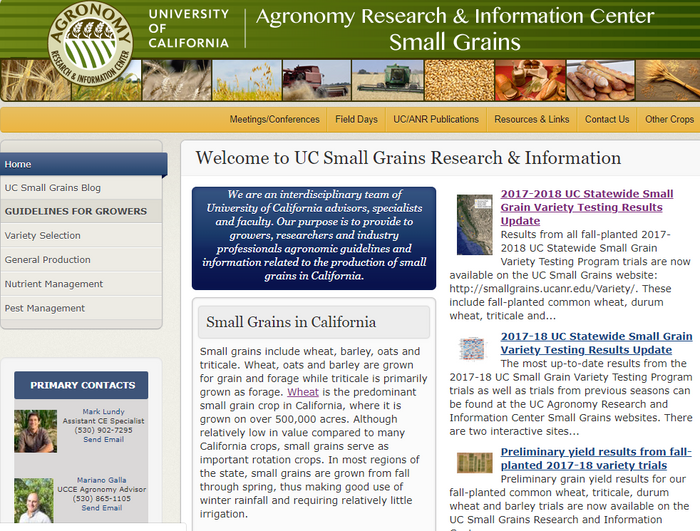 The UC Small Grains website (http://smallgrains.ucanr.edu/) is part of the University of California’s Agronomy Research and Information Center. Here you can find links to recent blog posts and other updates about UC research and extension efforts as well as contact information for UC Agronomists working with small grain production in various regions of the state. For more information:(http://smallgrains.ucanr.edu/Contact_Us/). Several of these Cooperative Extension Advisors are relatively new to their posts but are already contributing to the improvement of wheat and other small grain production in the state. The people working within Cooperative Extension are our greatest asset, and I encourage you to reach out to the CE Advisors in your part of the state to discuss research and extension activities that you would value. Results from the UC Statewide Small Grain Variety Testing Program can be found on the Variety portion of our website (http://smallgrains.ucanr.edu/Variety/). Included there are links to 2 interactive webtools we have developed and released over the course of the past year. The first webtool (http://smallgrainselection.plantsciences.ucdavis.edu/) delivers regional summaries of small grain yield, quality and agronomic performance based on 3 years of trial data. These multi-environment, multi-year summaries are what we recommend using for making variety selection decisions. The second webtool (http://smallgrainselection.plantsciences.ucdavis.edu/explore/) produces simple statistical summaries of trials on a single trial basis across multiple years. These summaries allow more customized exploration of the data, and also provide heat map and biplot figures that allow users to examine genotype x environment patterns in the data. Both sites have features that allow the user to view, filter and sort information interactively. In addition, tables produced at these sites can be downloaded as ‘.csv’ files for viewing and manipulation in MS Excel or similar software programs. For the best experience, we recommend viewing these sites using a laptop or desktop computer with an up-to-date version of Firefox, Chrome, or Microsoft Edge web browser (Microsoft Explorer will not work). In addition to these interactive tools, results are also available in table form (eg. 2018 results are here: http://smallgrains.ucanr.edu/Variety_Results/2018/). Historically, the California Wheat Commission Quality Lab has conducted grain and flour quality analyses for common wheat and durum varieties from a subset of UC Small Grain Variety Testing Program trial locations. During 2018, the California Wheat Commission Quality Lab greatly expanded the number of testing locations for which they produced common wheat grain and flour quality analyses. These expanded results from the 2016-17 statewide trials are now available on the UC Small Grains Agronomy Research and Information Center site: http://smallgrains.ucanr.edu/Common_Wheat_Quality_2017/. The expanded quality testing has been undertaken as part of the California Wheat Commission’s ongoing effort to increase information about California wheat quality and improve the overall quality of California-grown wheat. These results are also contributing to a current effort to create a wheat quality classification system in California. In cooperation with UC Davis small grains breeder Allison Krill-Brown, UCCE Advisor Konrad Mathesius, and farmers in the Sacramento Valley region, 3 trials were conducted in the Sacramento Valley during the 2017-18 season in addition to our normal statewide trial activities. These trials consisted of a unique blend of crop types, including both modern and heritage varieties, grown under organic and low-external-input conditions. The goal was to assess productivity potential across a wide range of genotypes in organic production environments. A combined summary of the productivity results from these trials is now available on the UC Small Grains Agronomy Research and Information Center site: http://smallgrains.ucanr.edu/Variety_Results/Organic_Low_Input_2018_Variety_Results/. A subset of these trial entries are also being analyzed for bread making and malting quality. As the season progresses, keep an eye on our UC Small Grains Blog (and sign up if you haven’t already) (http://ucanr.edu/blogs/smallgrains/). Over the past 2 seasons, we have posted in-season discussions here related to in-season nitrogen (N) management in the context of the current year’s weather (eg. http://smallgrains.ucanr.edu/Nutrient_Management/). In addition, take a look at the information we have put out about conducting and interpreting the results of a soil nitrate quick test (http://smallgrains.ucanr.edu/files/256250.pdf). This can be a useful tool for getting a quick approximation for your soil nitrate-N status. General Production Information for small grains specific to California environments is available in the UC Small Grains Production Manual (https://anrcatalog.ucanr.edu/pdf/8208.pdf). Good luck on the upcoming season and be sure to utilize the UC Cooperative Extension resources as the season progresses. We are the largest wheat milling state by capacity (Daily flour milling capacity is 124,302 cwts) Number of mills = 13. We grow all 6 classes of wheat, thanks to our diverse climate. Organic wheat demand is increasing. UC Davis has an organic wheat breeding program under the leadership of Dr. Allison Krill-Brown. 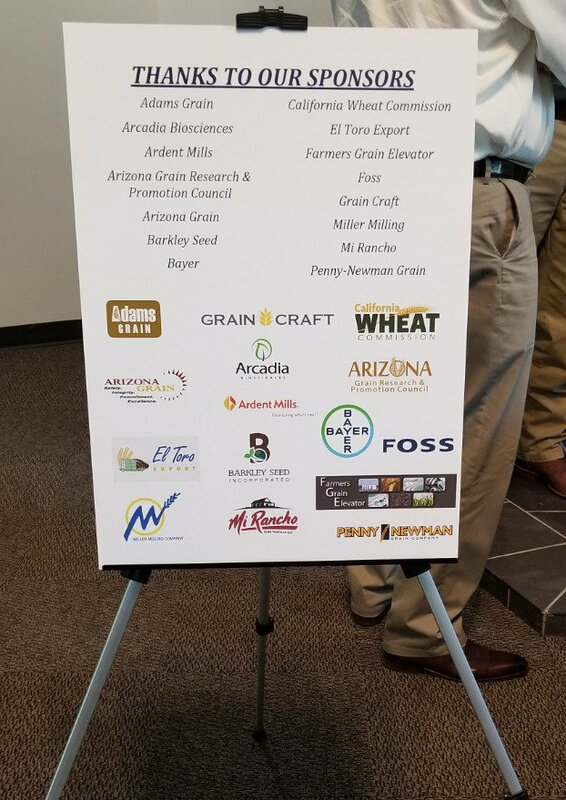 In collaboration with Arizona, we established the first successful wheat trademark: Desert Durum®. About 85% of our wheat can be produced under irrigation. California is the only State Wheat Commission with a Wheat Quality Lab on-site. The California Wheat Milling and Baking Quality Lab was established in 1990. The lab supports wheat research projects and quality testing for the University of California, Davis Breeding Program and Small Grains Variety trials. We also offer our services to customers who need quality test on grain or flour samples. The lab not only has worked with wheat but also with multiple grains such as: quinoa, sorghum, spelt, corn, etc. The Lab is part of the Commission’s research mission and it is founded by wheat growers from California. In addition, market development efforts in promoting lab services has been successful as you can see in the chart below. Over the last five years, the Commission has been able to increase its customers’ base and that has allowed the lab to sustain itself, and further eliminating the deficit trend. To learn more about our capabilities, please visit our website or call us if you have any questions. Every year, the CWC and the California Grain Foundation helps to bring wheat industry representatives in one room. At the meeting, participating mills bring their knowledge in wheat quality to evaluate new wheat varieties. The information is distributed and published electronically. This year we had almost 100 attendees. To learn more about our event and check out our photos, please click here. The CWC started being more active in Social Media to educate consumers about wheat, the Commission’s mission, and more. Since we started from September to today, our follower numbers on Instagram has increased from 150 to ~2,000.